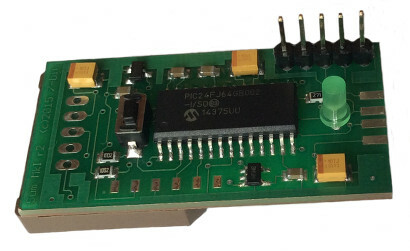 The Sum adapter, which is based upon a 16-bit Microchip microcontroller, enables you to connect USB HID keyboards to your Amiga. It has been designed to be installed inside the A1200's casing. The Sum adaper provides a built-in USB stack which enables USB HID keyboard support without the need to install additional software drivers. The device installation procedure is a matter of simply seating it upon the U7 chip located on A1200's motherboard. An additional feature of the adapter is its "Bootloader" function allowing future firmware upgrades. The Sum adapter comes with a dedicated configuration mode, which becomes available when R-Shift and Pause keys are pressed simultaneously. 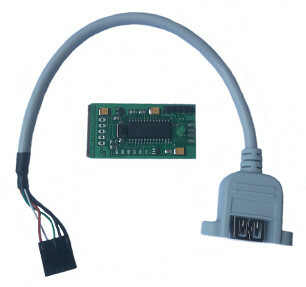 User preferences are saved to the built-in EEPROM, thanks to which the device is already configured the next time you reconnect it.